Our clients can avail from us a qualitative range of ROAD ASPHALT MIX PLANT .These are fabricated in accordance with the set industry standards using premium grade raw materials and advanced technology. We offer these in varied specifications and at competitive market prices. Our range is also made available in customized specifications as per their requirements. 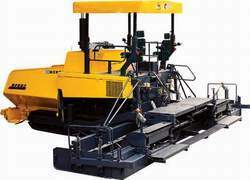 We are engaged in offering our clients with a qualitative range of RoadConstructionMachines. These are fabricated using quality raw materials and advanced production techniques in our manufacturing unit. We also comply with the required industry standards and offer these machines in varied specifications. Our range is also offered in customized specifications to meet the clients’ specific requirements. Looking for Road Construction Machinery ?